Dinosaur Comics - January 25th, 2011 - awesome fun times! 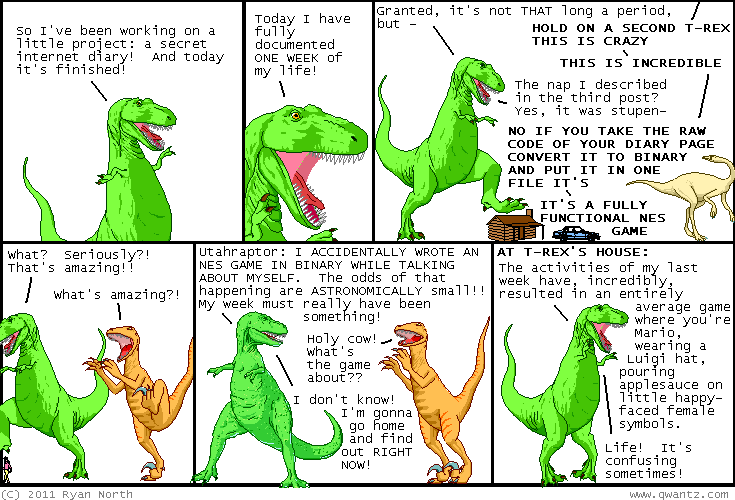 THING ONE: The Dinosaur Comics Distributed Computing Team (sixth biggest on the network, bigger that the teams of ENTIRE NATIONS) is chugging along nicely, doing a bunch of humanitarian computing (ironic for a comic about dinosaurs? oh ho ho) (not really) ANYWAY. I was contacted by The Harvard Clean Energy Project yesterday, and they're working on simulating molecules to find the best ones for cheap, effective solar cells. They've got an opt-in project on the grid and they're hoping Team Dinosaur Comics we'll opt in! I SAID WE WOULD DO OUR BEST. If you're not already a member of our team, join us; your computer can change the world in its spare time. If you're already a member, all you have to do is opt in! Harvard's set up a video for us here showing how. (Basically, on the World Community Grid site, go to "Device Manager" in the left-hand column, and set your Device Profile so it includes "The Clean Energy Project - Phase 2".) Tada! THING TWO: You can get signed copies of my new AND awesome book! It's for this week only.